An upscale, high quality base. Blue Label light beef base offers high quality and excellent value and can be used as a soup or sauce base. FOR SMALL QUANTITIES DISSOLVE 28 G (APPROX. 1 OZ) REDUCED SODIUM BEEF SOUP BASE IN 1 L (APPROX. 35 FL OZ) BOILING AND SIMMER FOR 3 MINUTES BEFORE SERVING. YIELD APPROX. 4 SERVINGS OF 250 ML (8 FL OZ). FOR LARGE QUANTITIES MIX 450 G (APPROX. 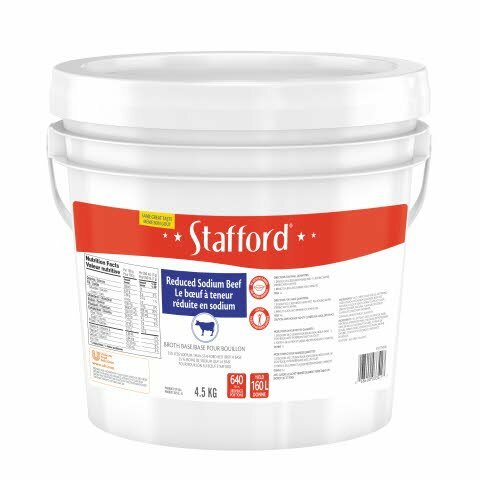 1 LB) REDUCED SODIUM BEEF SOUP BASE IN 16 L (APPROX. 3 1/2 IMP GAL) BOILING WATER AND SIMMER FOR 3 MINUTES BEFORE SERVING. YIELD APPROX. 64 SERVINGS OF 250 ML (8 FL OZ). Base, with no added MSG, is suitable for reduced sodium and reduced fat diets in environments where nutrition is important. Product is packed in 4.5-kg pail for smaller volume applications. 25% less salt than regular beef soup base. Low in fat. An upscale, high quality base. Blue label base offers high quality and excellent value and can be used as a soup or sauce base.